Takes years off your appearance. Gently firms the underlying muscles of the neck and tightens the skin for a dramatic lift. Dramatic results in just 2 minutes a day! 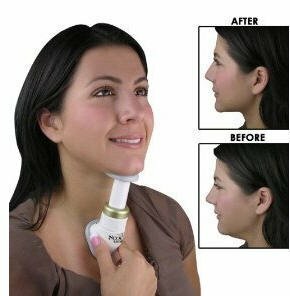 Neck Genie will give your face a lift resulting in tighter and firmer skin. It eliminates sagging skin and can reduce a double-chin or neck folds. The Neck Genie does for your neckline what exercise does for your body, making you look and feel younger. Take years off your appearance and gently firm the underlying muscles of the neck and tighten the skin without expensive plastic surgery. Use just two minutes a day and the Neck Genie will help you tighten and tone your neck, chin and face the quick, easy, pain-free way. Redefine your profile, reduce facial sagging and take years off your appearance! The secret is in its three resistance power coils that gently firm the underlying muscles of the neck and tighten skin at the same time for a dramatic lift. Enjoy age-defying results by using just two minutes a day!